Shop the Invite Health catalog to integrate vitamins into your life through the proper "family" of nutritional supplements from the best multivitamins and fat burning supplements to green tea tinctures and Resveratrol. Improve your overall health with a vitamin supplement and diet plan for total health and nutrition. Supplement and diet - InVite Health knows the key to good health involves finding the perfect supplement and diet for each individual. Allow InVite Health to choose the right supplements for you and your family from garlic supplements and zinc supplements to fat burning supplements to curb your appetite. With the right supplement and diet nutrition from InVite, you're bound to live a long healthy life. Quercetin supplement - For the powerful antioxidant support found in apples and teas, turn to the natural anti-histamine and anti-inflammatory Quercetin. Research shows that adding a Quercetin supplement to your diet may benefit your eyes, respiratory system, prostate and more! Fat burning supplements - Burn fat and add nutrition to your diet for total weight management. InVite's safe and all-natural products combine powerfully effective nutrients to help you lose weight or maintain your ideal weight, while promoting lean body mass and increased energy levels- all while sustaining healthful nutrition. 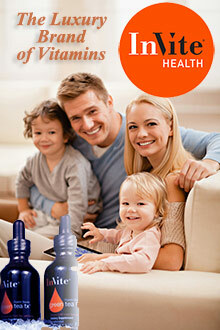 Multi-Vitamins - Scientific research strongly supports the daily need for essential nutrients for the body to function. InVite Health's core program, its family of multi-vitamins, serves as the foundation for a healthy lifestyle. The "Multi-family" offers nutritional support for everyone in the family: men, women, children and even one for performance. Green Tea Tx - Tincture Drops - An abundance of scientific literature supports the many health benefits of polyphenols and other antioxidants found in teas, fruits, berries and herbs. InVite Health has alleviated the stress of staying healthy by introducing its all-natural InVite Tx - Tincture Drops in one small glass bottle. Through the process of extracting the necessary ingredients from plants, InVite Health has ensured a superior but convenient and tasty way to obtain antioxidant support. Resveratrol - Although the environment has an undying impact on the activity of our genes, their activity can be modified and improved dramatically by InVite Health's product, Resveratrol. Resveratrol displays a dramatic ability to improve the activity of very protective genes including those associated with healthy cellular function, healthy glucose metabolism, and healthy bone building and shielding against negative environmental impact. This product is InVite Health's offer for a healthy life and long lifespan. Whether you're looking for fat burning supplements, a child vitamin regimen for your kids or the best multivitamins for adults, you'll be amazed with the nutrition benefits InVite has to offer. Staffed with genuine healthcare professionals equipped with strong academic credentials, InVite Health also prides itself in assisting the customer with designing this picture-perfect lifestyle of health and wellness by proffering a Listen Live Radio show in many markets.